AFTER the publication of Asli’s finding of bumiputeras’s equity of about 45%, many Umno leaders including Prime Minister Abdullah Ahmad Badawi objected furiously. Umno vice-president Muhyiddin Yassin demanded the retraction of the report and he succeeded. Subsequently Dr Lim Teck Ghee, Asli’s director who took full responsibility, resigned. He is prepared to stand by his finding and the method he used in his calculation. A few days ago, Gerakan president Dr Lim Keng Yaik requested the government to reveal the methodology they used to arrive at a such low figure of 18.9%. Then Deputy PM Najib Tun Abdul Rasak said the government is willing to make public the methodology used by the Economic Planning Unit (EPU) to calculate the corporate equity ownership of various communities. He said that this would dispel any lingering doubts about the authenticity of the figures by EPU, which comes under the Prime Minister’s Department. In 1970, the bumiputeras had 2.4% equity when the NEP was first introduced. After 20 years, in 1990 it was acknowledged that the bumiputeras had 19.4% equity. Now they claim that they have only 18.9% equity, less than what they had 15 years ago. How can this be possible when the government did not stop giving out special privileges under the NEP all along? It seems like every body is arguing whether the NEP should be prolonged but no one is questioning whether it is doing any good for Malaysia as a whole nation. However, I am not here to expound a new method of measuring to resolve this controversy. But I wish to take this opportunity to point out the weaknesses of the NEP. The fact that they claim to have far less than what they expected, can only mean that the NEP cannot produce the desired result. Moreover, the NEP is not helping us to achieve our vision 2020. NEP is really the stumbling block and I will explain with some vital statistics so that we all can see that the NEP is actually doing more harm than good for the nation as a whole. 1) Gross Domestic Product (GDP) per capita, this is an indisputable standard of measuring the economy of a nation. 2) Human Development Index (HDI) is a comparative measure of poverty, literacy, education, life expectancy, rate of deaths at childbirth and other factors for countries worldwide. 3) Transparency International Prospective Corruption Index (TIPCI). This agency looks at the government’s procurement system, e.g. awarding billion ringgit contracts without inviting open tenders, and the issues of business licenses and permits. This is one area where an ill defined system can lead to corruption involving huge sums of money. The system must be just, fair and transparent to all citizens and foreign investors. 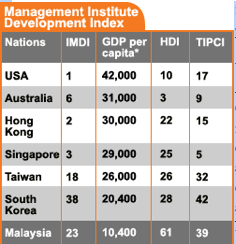 4) Institute of Management Development Index (IMDI), this institution is based in Lausanne, Switzerland. It measures a nation’s competitiveness relative to other countries in the world, based on economic performance, government efficiency, business efficiency and infrastructures, and facilities for doing business. I have extracted the relevant statistics for Hong Kong, Singapore, Taiwan and South Korea which had about the same GDP/Capita in 1970 when the NEP was first introduced, to compare with Malaysia. These neighbouring countries have progressed much faster than us and they are now classified as developed nations. As a standard marker, I have included USA. I have also included Australia, which has about the same population as ours and it has remarkable statistics for us to emulate. Statistics do not lie and the numerical figures project the true picture. As in the IMDI survey, the World Economic Forum based in Geneva, in its ranking also stressed the need for Malaysia to improve its domestic business environment for the next stage of development. Among the areas that need greater attention, according to both organizations, is government red tape. On this criterion, the World Economic Forum ranked Malaysia 101st among 117 countries worldwide last year. Compliance of all the NEP conditions is often the obstacle especially for foreigners. Indisputable statistics show that NEP is retarding our progress and Malaysia has lost the way to vision 2020. When the New Economic Policy (NEP) was introduced in 1970, the GDP per capita of our neighbours, Singapore, Hong Kong, Taiwan and South Korea were all about the same as ours. After 36 years, Singapore and HK are three times, Taiwan is 2.5 times and South Korea is two times our GDP per capita. The differential gaps between Malaysia and these four countries are getting wider and wider as time goes by. These figures are indisputable and definitely show that the NEP is doing more harm than good to our economy. We are growing slower than our neighbours despite the fact that we have fossil fuel, palm oil, rubber and other natural resources which they do not have. At this growth rate, Malaysia will never ever become a developed nation. Khalid Ibrahim, former CEO of Kumpulan Guthrie Bhd and presently Parti Keadilan Rakyat treasurer, said it is most unlikely Malaysia will become a fully developed nation by 2020 at a recent forum on the 9th Malaysian Plan. Instead of disputing the accuracy of Asli’s report to justify prolonging the implementation of the NEP, our government should make drastic policy changes to improve efficiency and competitiveness. Our leaders must realize that the global competitive market does not make allowance or special handicap for bumiputeras. All the political rhetoric demanding the continuance of the NEP at the last Umno general assembly will not make Malaysia a developed nation by 2020. The statistics definitely show that the NEP is retarding Malaysia’s progress. Unless the government is bold enough to make changes, Vision 2020 will not be achieved. At the moment, it looks like Malaysia has lost its way to Vision 2020. Do our political leaders realise that? To become a developed nation we must at least double our GDP per capita from US$10,000 to US$20,000. The only way is to accelerate our GDP growth rate by practicing real democracy and meritocracy so that we become more efficient and competitive to face global challenges. Are our political leaders willing to practice real democracy and meritocracy? It is a system of management which is strictly based solely on one’s abilities [merit] rather than by political connection, social position or race. Merit means ”intelligence plus effort”. It is quite different from aristocracy or NEP which is a system that caters to biased practices and nepotism. True meritocracy acknowledges individual prowess and rewards it in kind, regardless of disposition. Meritocracy is one of the most important principles in all of human civilization. It is most important to practice meritocracy in the student selections for entrance into our universities and institutions of higher learning. If we accept lower grade students we can only get lower grade graduates. When we have lower grade graduates to manage all our government and private sector services we can only expect lower grade results. It is also essential to practice meritocracy in the selection of employees. The most qualified must be given employment and for promotion the best and most efficient employee must enjoy recognition so that everyone will try his best to get promotion. Otherwise management will lose its respectability and the whole workforce will not work efficiently. There has been no Malaysian of ethnic Chinese or Indian origin appointed as CEO of any of our GLCs, government departments and universities. Surely, there must be at least one capable ethnic Chinese or Indian available for the job. Perhaps that is why almost all the GLCs eg MAS, Proton and universities are under performing. Under the pretext of the NEP, the government can simply give out large contracts without open tenders to enrich bumiputeras and no one can question this, not even in Parliament. Only a few well connected Malays will benefit from these handouts but a lot more who did not get the benefit are grumbling. The gap of the rich and poor bumiputeras is getting wider. Many will bribe their way to get some of these goodies. The problem is that the authorities cannot find enough APs and other goodies to distribute; so they clone their own APs. This defeats the original aim of the NEP. So what is a developed nation? All developed nations practice democracy and meritocracy. Their constitutions decree that all men are created equal and that life, liberty, and the pursuit of happiness is not to be infringed upon. All their citizens irrespective of their race or religion can expect justice, equity and equal opportunity. As a result, their citizens enjoy a higher standard of living than Malaysians. If Malaysia wants to be a developed nation, our government must accord justice, equity and equal opportunity to all Malaysians irrespective of race or creed. Are our political leaders willing to make changes? Najib’s New NEP a step forwards or backwards?